Camping in Lake County is a positive and rewarding experience. Whether you are looking for a rustic and secluded campsite or a well-developed one, whether in the mountains or on the desert, there is a campsite to please any outdoor lover. Make a selection or scroll down to read all. Maps and additional information are available at the Fremont National Forest Website. Located near Thompson Reservoir, Alder Spring Campground is small and rustic with three camp sites. There are places for fires, but no drinking water or tables. The suggested season for this campground is June through to November. Fire restrictions may apply, especially during the fire season. Restrictions: Check for fire regulations during fire season. Upper and Lower Buck Creek Campgrounds are located along Buck Creek near Silver Lake. There are good opportunities available for fishing, viewing wildlife, photography, and finding wildflowers. Upper Buck Creek Camp has six campsites, three with tables and two outhouses. Lower Buck Creek Camp has five campsites, two having tables, and two outhouses. Drinking water is not available at either campground so you will need to bring your own. It is recommended that vehicles are kept 100 feet from the creek's edge and that you check with the Silver Lake Ranger District for any fire restrictions. The recommended season for these campsites is May to November. Restrictions: Keep vehicles 100 feet from creek's edge. Check for fire restrictions during fire season. South of Silver Lake is Bunyard Crossing Campground. This is a good area for fishing, hiking, bird and wildlife viewing and photography. There are three campsites, two with tables, and two outhouses. Drinking water is not available. Campers are welcome to gather firewood near the campground for camp use, but check with the District office for fire restrictions. Please keep vehicles off of the grassy meadow along the creek. Restrictions: Check for fire restrictions during fire season. East Bay Campground at Thompson Reservoir is a very nice, developed campground with some handicap-accessible sites. There are seventeen tent and trailer and four day use sites. All sites have picnic tables and fire grates. A boat ramp and fishing pier accommodates fishermen and boaters. Drinking water and outhouses are available. 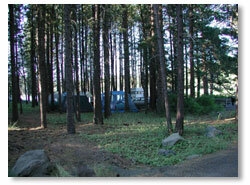 The campground is maintained from May 1 to October 15. You will need to bring your own firewood and there is a campground fee of $8.00. 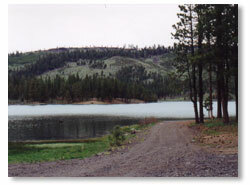 Thompson Reservoir Campground is located on the west side of Thompson Reservoir. There are nineteen tent and trailer sites with picnic tables and fire grates. There is drinking water at the campground and firewood is located off site. This campground is maintained from May 1 to November 15. Before you reach Thompson Reservoir, you will reach Silver Creek Marsh Campground. This campground has access to the Fremont National Recreation Trail. The trail is open to hikers, horseback riders, and mountain bike riders. There are 8 tent and trailer sites with picnic tables and fire grates. Drinking water, horse corrals and water troughs are available. Firewood is available off the site. It is maintained between May 1 and November 15. Trapper Spring Campground is located to the north-east of Silver Lake. The recommended season is from May to November and the area offers an opportunity for wildflower viewing, hiking and relaxing. The campground has two campsites, one with a picnic table and fire grate. There is one outhouse, and drinking water is not available. Deep Creek Campground is a rustic setting in the Crane Mountain area. Wildflowers are abundant in spring and early summer; and fishing, birdwatching, wildlife viewing, wading, and hiking are other popular activities for this campground. The Crane Mountain National Recreation Trail can be accessed at Rogger Meadow Trailhead 10 miles to the west. There are 4 tent and trailer sites and 2 secluded sides along the creek. The campsites have picnic tables and fire grates. Outhouses are available. It is maintained from June 1 through October 15. Deep Creek Campground is 5,600' above sea level. Dismal Creek Campground is adjacent to Dismal Creek, offering fishing and wading opportunities for campers. There are 3 tent and trailer sites with picnic tables and fire grates. Outhouses are located at the campground. It is maintained from June 1 through October 15. Crane Mountain National Recreation Trail is 11 miles to the west and can be accessed at Rogger Meadow Trailhead. Other activities include birdwatching and wildflowers. Situated just a stone's throw from the California border, Goose Lake State Park is Oregon's southern-most park. It is a well developed park with 48 tent/trailer sites with electric hookups. There are showers, drinking water, flush toilets, and a dump station available. There are plenty of opportunites to observe wildlife, wildflowers, or birds, often within the park boundaries. Picnic tables and shade trees are available at each campsite and there is plenty of room for children to run around. There is also a large day use area. This is a good campground to station as a home base when planning day trip activities in the area. Contact the Oregon State Parks & Recretion Department for reservations. The campground rates are $12 and $5 for extra vehicles. Camp Sites: 48 tent/trailer, 50 ft max. length. Restrictions: Reservations are taken, although not required. (541)947-3111 or (800)551-6949. The campground rates are $12 and $5 for extra vehicles. Twin Springs Campground has 3 tent and trailer sites with picnic tables and fire grates. Drinking water and outhouses are available. The quiet campground is 6,300' above sea level. There are good opportunities for birdwatching and wildlife viewing. Crane Mountain National Recreation trail is 2 miles to the west, accessed through Rogger Meadow. The recommended season is from June 1 through October 15. Willow Creek Campground is 5,800' above sea level and is adjacent to Willow Creek. Eight tent and trailer sites are available. Although drinking water is not available, the campsites have picnic tables and firegrates. Outhouses are available. Activities include fishing, birdwatching, wildlife viewing, wading and hiking. Through Rogger Meadow, the Crane Mountain National Recreation Trail is 4 miles to the west. There are twenty-one campsites, with several larger pull-through spaces for trailers. Picnic tables and fire grills are at each site and drinking water is available. Several outhouses are spaced throughout the campground. Campbell Lake is a popular fishing hole. A boat ramp is available, but only electric motors are allowed on the lake. There is also close access to the Lakes Trail system, which loops between Campbell and Deadhorse Lakes and the Gearheart Wilderness area. Restrictions: Electric boat motors only. Check for fire regulations during fire season. One mile farther down the road from Campbell Lake and its campground is Deadhorse Lake Campground. There are sixteen campsites, 9 for tents and trailers, and 7 for group camping. Drinking water is available. Outhouses are in several places throughout the campground. There is a separate area for day use and a boat launch. Motors are limited to electric ones. There is close access to the Dead Horse Rim and Dead Cow Trail systems. Corral Creek Campground is located at the base of the Gearhart Wilderness area at 6,000' above sea level. There are 6 tent and trailer sites with picnic tables and fire grills. Drinking water is not available. Firewood is not available but may be gathered nearby for camp use. There is an accessible outhouse. Box-style horse stalls are also available. Access to the Gearhart Wilderness Area and its hiking trails are available from Corral Creek Campground. There are also excellent opportunities for birdwatching and fishing. The campground is maintained from May 15 through October 31. Deadhorse Creek Campground is located along Dairy Creek about 25 miles from Paisley. The elevation is 5,400'. Rock fire pits are available at the 4 campsites. There is an outhouse. The recommended season is from April through October. Firewood may be gathered nearby. Water is available at Clear Springs, located nearby the campground. Activities at the campground include stream fishing for rainbow trout and birdwatching. Approximately 23 miles from Paisley is Happy Camp. Some of the 9 tent and trailer sites are pull through and three 1930's picnic shelters are available. Drinking water is available from 2 faucets in the campground. Dairy Creek runs near the campground and offers fishing opportunities. Birdwatching, wildlife viewing, and wading are also popular activities. Firewood can be gathered nearby for camp use. No reservations are taken and it's first come, first served. Jones Crossing is 9 miles from Paisley along the Chewaucan River. It has 2 campsites with picnic tables and rock ring fireplaces. Other sites are available without tables. An outhouse is available. Firewood must be gathered nearby. Drinking water is not available. The recommended season is from April through October. Fishing for rainbow and brook trout is a popular activity. This is also a good place to do some birdwatching and see a variety of wildflowers. Please keep all vehicles 100 feet away from the river's edge. Restrictions: Keep vehicles 100 feet from river's edge. Check for fire regulations during fire season. Upper Jones Campground is a small campground 1-1/2 mile from Jones Crossing campground. Situated along the Chewaucan River, there are good opportunities for fishing and birdwatching. There are two campsites with rock rings. Firewood can be gathered nearby. Please keep all vehicles 100 feet from the river's edge. Drinking water is not available. Restrictions: Keep all vehicles 100 feet from the river's edge. Check for fire regulations during fire season. At 6,306 feet, Lee Thomas Campground is located along the North Fork of the Sprague Wild and Scenic River. There are 8 tent and trailer sites with picnic tables and fire grills. Drinking water is available from a hand pump. Steam fishing is available for stocked rainbow trout. Birdwatching is another popular activity. The campground is located near the Deadhorse Rim Trailhead. The campground is maintained from June 1 through October 31. Bring your own firewood or it can be gathered nearby. Mosquitos are numerous in Spring and early Summer. This is a popular camp for hunters in the fall. Marster Spring Campground is nestled along the Chewaucan River about 7 miles from Paisley. There are 11 campsites with fire rings and picnic tables. An accessible outhouse is available. Drinking water is located at the campground via a hand pump. It is maintained from May 15 through October 31 and is a popular campground. No reservations are taken so it is first come, first served. Popular activities are fishing for rainbow and brook trout, birdwatching, wildflowers, and wildlife viewing. The Fremont National Recreation Trail is accessible 1/4 mile to the south at the Chewaucan Crossing Trailhead. 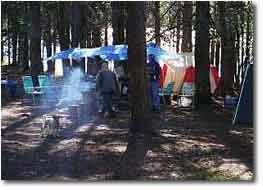 Upper Marster Campground is a rustic campground along the Chewaucan River 8 miles from Paisley. There is 1 campsite with a fire ring and picnic table. There is an outhouse but no drinking water. Firewood can be gathered nearby. The recommended season is April through October. Pike's Crossing Campground is 32 miles from Paisley next to Paradise Creek and the Sycan Wild and Scenic River. There are 6 campsites with rock fire rings. Outhouses are available. Steam fishing for native trout, birdwatching, and wildflowers are popular activities. It is a quiet, secluded campground most of the year, but is popular and usually full during the hunting seasons. Drinking water is not available so make sure to bring your own. May through October is the recommended season for this campground. Rock Creek Campground is also adjacent to the Sycan Wild and Scenic River. It is 24 miles from Paisley. There are 4-6 campsites with rock fire rings. Drinking water is not available, but there are outhouses at the campground. The recommended season is May through October and is usually full during the fall hunting seasons. Other activities are fishing for native trout, birdwatching, and wildflowers. It is close to the Hanan trail at the Hanan/Sycan Trailhead. Sandhill Crossing is located along the North Fork of the Sprague Wild and Scenic River at 6,306' in elevation. There are 5 tent and trailer sites with picnic tables and fire grills. Drinking water is available via a hand pump. Fishing for stocked rainbow trout is available. It is not far from the Gearhart Wilderness trails and is maintained from June 1 through October 31. 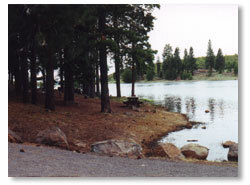 Slide Lake Campground offers campsites at both the trailhead and Slide Lake. There are 1-3 campsites with rock fire rings. Quiet and secluded, Slide Lake offers a good opportunity for trout fishing or just relaxing. The Slide Lake trail offers access to Slide lake for fishing and picnicking. For most of it's length the trail follows an abandoned road. The collapsed face of Slide Mountain is a geologically interesting view. The recommended season is May through October. Firewood may be gathered nearby but drinking water is not available. A small parking area is available at the Slide Lake trailhead and it is approximately 3/8 of a mile from this point to the lake. Holbrook Reservoir Campground is a popular fishing area located about 30 miles west of Lakeview on Quartz Mountain. The site is maintained from May 15 through October 31. Campsites are limited. There is a picnic table and fire grate and outhouse at the campground. A boat ramp is also available. Only electric motors are allowed with a 5mph speed limit. Fishing, swimming, birdwatching, and wildlife viewing are all popular activities at this lake. There is no drinking water available and firewood may be gathered from the surrounding area for camp use. Lofton Reservoir is located a few miles from Holbrook Reservoir and is a well developed, popular campground with excellent fishing opportunities for everyone.. There are 26 tent and trailer sites with picnic tables and fire grates. Drinking water and outhouses are available. There is a boat ramp, although boats are limited to electric motors and a 5mph speed limit. There is a waste gray water dump. The campground is maintained from May 1 through October 31 and a campground host is available to answer questions. An accessible fishing pier is located on the west side of the lake. 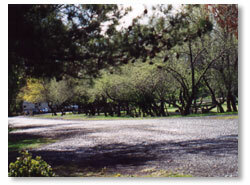 Drew's Creek Campground is a popular area for group camping and picnicking. There are 5 tent and trailer sites with picnic tables and fire grates. Drinking water is available. There are outhouses. Horseshoe pits and a softball area are also available. Other popular activities are fishing, birdwatching, wading, wildlife viewing, and a paved bike lane to Drew's Reservoir. Drew's Reservoir also provides opportunity for boating, water-skiing, and swimming. Dog Lake Campground has 8 tent and trailer sites with picnic tables and fire grates. It is located about 32 miles west of Lakeview. Outhouses, a boat ramp, and drinking water are also available. Dog lake is a popular fishing area for warm and cold water fish. The campground is maintained from June 1 through October 15. 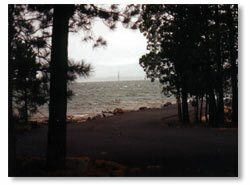 During 2001/2002,additional campsites were added near the lake. The Cottonwood Recreation Area is a popular area for fishing and is located about 35 miles west of Lakeview. There are 12 tent and trailer sites and 9 secluded tent sites. Picnic tables, fire grates, and drinking water are available. There are 2 boat ramps. Boats are limited to electric motors. The campground is maintained from June 1 through October 15. At 6,100' it may not be open until late spring when the snow melts from the roads. Trail systems are open to hikers, horseback riders, and mountain bike riders. Other popular activities include fishing, swimming, wildlife viewing, and birdwatching. Can Springs Campground is located in the Warner Mountains on the edge of the high desert in stands of large ponderosa pines. It is two miles from the Swale Trailhead which gives access to the Fremont National Recreation Trail. There is an outhouse and each campsite has a picnic table and fire grates. Other recreational opportunities include birdwatching, wildlife viewing, wildflowers, and photography. The trail is open to hikers, horseback riders, and mountain bikes. The campground is maintained from June 1 through October 15. Overton Reservoir is stocked with trout. The campground has outhouses and the sites have picnic tables and fire grates. It is maintained from June 1 through October 15. Besides fishing campers have opportunities for birdwatching, wildlife viewing, photography, and wildflowers. Vee Lake overlooks the Warner Wetlands and Hart Mountain. It is 6,000' above sea level. There is an outhouse and boat launch. The trailhead for the Fremont National Recreation Trail is located at Vee Lake. Activities include fishing, birdwatching, wildlife viewing, hiking, sightseeing, and photography. The trail is open to horseback riders and mountain bike riders. Hager Mountain Lookout is a fire lookout building 7,200' above sea-level. The lookout is accessed by road, open to four-wheel, high clearance vehicles, or by trail (2.1 miles). The road is open when the lookout is staffed. Accommodations include a toilet facility, horse tie racks, a picnic table, and lookout building. Reservations are required (541-576-2107). There is a $25 per night fee. The lookout provides spectacular views of the high desert country and the Cascade mountain range, including Mount Shasta. It is recommended as a winter rental from November through April. Aspen Cabin is a summer rental located in the central Warner Mountains. The cabin will accommodate 6 people. There is a wood stove in the cabin. An outhouse is available. Renters will need to bring camping gear. Drinking water is not available. Reservations are required (541-947-6359). There is a fee of $25 from noon to noon. Activities include fishing, wildlife viewing, hiking, wildflowers, and birdwatching. The Crane Mountain National Recreation Trail can be accessed 3 miles to the southwest at the Walker Trailhead and the Drake-McDowell Semi-Primitive Non-Motorized area is 2 miles to the east. The recommended season is from June 1 through October 15. Fremont Point is a historic cabin located on the cliff face of Winter Ridge overlooking Summer Lake. It is 7,135' above sea level. The cabin will sleep 4 people and has a wood stove and outhouse. Snowmobiling, cross-country skiing, wildlife viewing, and hiking are popular activities. The rental is available year-round and may be accessed in the winter via snowmobile or skiing. Contact the Silver Lake District Office for reservations (541-576-2170). It is $25 per night. Bald Butte Lookout is a fire lookout building at 7,536' and is located near the Gearhart Wilderness Area. It offers a view of three western states and is furnished. It will hold 2 to 4 people and has a double bed, shelves, table and chairs. Propane powers the cooking and heating appliances. The outhouse and lookout are accessible. The recommended season is from June 1 through October 31, with vehicle access as the weather allows. Contact the Paisley District Office for reservations (541-943-3114). There is excellent opportunity for photography, birdwatching, hiking, wildflowers, and just relaxing. The Currier Guard Station Cabin is located roughly 30 miles from Paisley near the Sycan Wild and Scenic River area. A rental fee of $30 is charged per night's stay. Contact the Paisley Ranger District for reservations (541)943-3114. It is designed to hold 3-4 people and has a bunkbed, double bed, table and chairs. It is a two room cabin. Propane fuels the heater and cook stove, and refrigerator. Renters will need to provide their own cookware, table service, bedding, and drinking water. It is open from June 1 through November 15.